Thank you for voting for your Board of Directors! 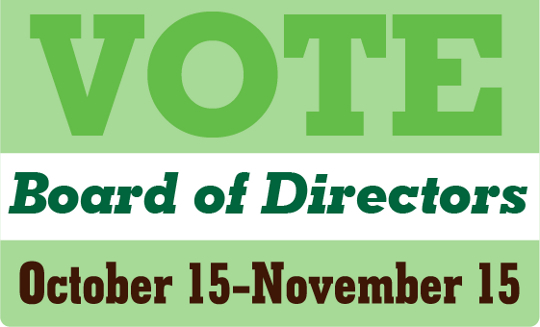 Your vote is your voice: use it to help shape the future of the Co-op. These elections have been decided by 1–30 votes in the recent past. One vote — YOUR vote — can make a difference! Voting changes the future, from budgets to boycotts to the overall trajectory of the organization. Who you choose influences your Co-op! By casting a vote, you participate in 40 years of tradition, and help us to continue to drive our mission and values by selecting members of our community to serve the Co-op on your behalf. The Board of Directors is the elected body that represents the membership by establishing policies, overseeing the operating and capital budgets, approving plans and recommendations, and setting general guidelines for the staff collective and working members. The Board holds ultimate legal responsibility for the operations and actions of the Co-op. 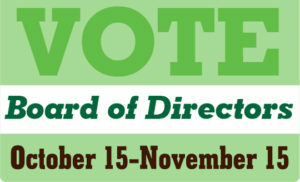 Use your vote to make sure our Directors represent your vision for the future of our cooperative! Every year we have three positions open for a 3-year term. My offer/desire to serve on the Co-op Board is based on my prior experience as a Board member; I believe the Co-op is an important asset to our community, and appreciate the critical con­tributions made by staff and members every day. I was honored to serve on the Board from 2003 to 2006 and worked on several committees, including the hiring committee and the newsletter committee, while also working full-time in other employment. Over the last ten years I continued working and found some time for volunteer work, including serving as a community representative to the Lincoln Options Board, and as a mediator at the Dispute Resolution Center. I was an active union member with WFSE Local 443 throughout my state career, and recently retired from state employment. I now have the time and energy to offer to serve on the Co-op Board once again. I am currently a volunteer cashier at the Eastside store/loca­tion. I would bring to the Board: a sense of workplace justice; an understanding of volunteer needs and commitments; prior Board and Committee experience; clear communication and media­tion skills; a sense of irony and humor, along with a strong desire to work with other members to create and maintain the best Olympia Food Co-op yet. I am very interested in continuing the discussions around expansion and envision new opportunities for our communi­ty in this regard. My basic vision for the Co-op is to continue follow the mission statement, which provides the core values we maintain as an organization and a community. I am happy to note that the Co-op has continued to evolve into a more inclusive and diverse community, reflective of the membership we welcome and support, and I believe we will continue to grow and create an inviting space for amazing food and community resources. In my expanded vision, I imagine a future Olympia Food Co-op store with more space for food preparation and service (in addition to the eastside deli bar/sandwiches/soup, etc), where community members can gather to eat, drink and be merry (or not), to hold gatherings, committee meetings, and/or small events/classes. I envision this in collaboration with other community partners, especially those working for food justice issues, and truly believe that it can be achieved. I believe it is in our power to work together as a community partner to ensure that future generations benefit from the work of our Co-op, i.e., to support healthy choices for ourselves, our community, and our planet, and to follow our mission statement for another 40 years and beyond. I basically grew up in the Co-op and value its impact on the community a great deal. Having already served one year on the Board, I want to use my experience to help the Co-op continue to grow and flourish. I have strong communication skills and am good at collaborating. I am good with and enjoy math. I have a lot of energy and passion for the Co-op. After serving a year on the Board already I have a good understanding of the work environment. I would like to see the Co-op someday grow to compete meaningfully with the big box grocery stores in Olympia. Realizing our goal of providing good food to more people is going to require us to expand. I intend to continue my work with the expansion committee to help realized this goal. I have been a member of the Co-op, since I moved to Olympia. Remembering the days as a co-op member in Vermont when we would all gather once a month in a local grange hall and divide up the 50 and 100 pound bags of grains and various fruits and vegetables was a simple means of gaining access to healthy food inexpensively and communally. Fast forwarding to the present and entering a store that offers a diverse selection of foods, goods and services with the same philosophy of the members arriving and helping to make the food available in an affordable manner is still important as ever. The Olympia Food Co-op has grown into a community of workers, members and suppliers. The possibilities to expand and deepen these relationships while reflecting a model for being engaging, encom­passing and compassionate is exciting. I have worked in the not for profit world for many years as a staff person, fund-raiser, executive director and board member. I am familiar with the legal and financial aspects of running a co-op, having been a founding member of a co-op, and the dynamics of supporting a service business where the bottom line is not the dollar, but the people serving and being served. My most recent involvement locally was as a Board Member of TULIP Community Credit Union which arose and lived in the eastside store from its beginning more than 10 years ago until it grew to a point of needing a larger office to combine its two locations in downtown Olympia to better serve TULIP’s low-income members. The Food Co-op has become an integral part of the greater Olym­pia community through providing accessible healthy food, support of local growers, artisans and business people and as a model for business and personal interaction. My vision is to continue these goals and objectives and insuring the financial viability of the east and westside stores. Part of this goal is to help with an understanding of how well we are reaching and making ourselves accessible to not only the low-income population through awareness and accessibility but other segments of our community who have never walked through our door. I have been a volunteer for many years at the eastside store through offering classes and other projects. I have an active sense of the feeling and support coming forth from the volunteer members and shoppers. This combined with the dynamic going on in our world and our local community that is different than most of us have ever seen before. We are being presented with an us and them perspective. This way of looking and being in the world is hurting everyone. The model and relationship that the Co-op has are important living examples. I am very interested in deepening this along with propagating the co-op way in our region. The Olympia Food Co-op has offered me a welcoming resource to acquire healthy, deli­cious, and responsible food for my family. There are many people who help make this happen, and I would like to contribute to the organization by rep­resenting the members and mission of the Co-op by serving on the board of directors. For 19 years, I have worked collaboratively with nonprofit and professional organizations to help achieve their goals while embracing the principles of responsibility and democracy. I previously served as a trustee at the Olympia Masonic Building Associa­tion for five years, and I served for four years on the board of directors for a cemetery. In 2016, I facilitat­ed equitable meetings supporting the principles of brotherly love, relief, and truth as Worshipful (meaning respectful) Master of Olympia Lodge #1 Free and Accepted Masons, and I remain the co-chairman of the Lodge’s scholarship program. I have attended several Olympia Food Co-op board meetings over the last year, and I agree with the values of the mission statement and admire the board’s decision-making processes. Professionally, I am a financial advisor at Merrill Lynch in downtown Olympia. I would like to see the Co-op continue achieving the goals outlined in the mission statement and to expand or relocate the eastside location if and when it is financially responsible to do so. The Olympia Food Co-op is a treasure to its members and helps define our city. If elected, I would act in good faith to assist the organization fulfill its goals. Having attended some of the Co-op board meetings over the last year and relating to its culture, I feel I would be a good addition to the board. I usually shop at the eastside store and enjoy the salad bar and trying out staff picks. Thank you for your consideration.